Last Monday Joe Arpaio appeared in the headlines of the New York Times: “Sheriff Joe Arpaio, Accused of Targeting Latinos, Is Charged With Contempt.” The article details a years-long legal battle over allegations that Arpaio has continually directed Arizona law enforcement to specifically target Latinos. This is not Joe Arpaio’s first appearance in the news; here’s a short trip through the headlines to provide context for Richard Montoya’s portrait of a charismatic, embattled, and notorious man. The sheriff aired his grievances in a recent campaign commercial. “You know, this latest action by Obama and his Department of Justice is all about illegal immigration, period,” he tells the camera, against a photo backdrop of the president, former Attorney General Eric Holder and current Attorney General Loretta Lynch. “They’ve been after me since day one, for doing my job." Since 1992, despite widespread criticism from human rights groups and local political leaders, Arpaio has been re-elected four times in Maricopa­ County, the most populous area of Arizona and a bastion of retirees and conservatives for whom Arpaio is a white knight, a defender of the 1950s Shangri-La they've sought to preserve in the largely white suburbs that ring Phoenix. […] No one believes Joe Arpaio will lose his own re-election bid this fall, least of all Joe Arpaio. Half of voters in Maricopa County still approve of him, despite his almost entirely negative press. The Rolling Stone portrait of Arpaio is one of a colorful, corrupt politician who knows how to appeal to his constituency. Arpaio is a master at branding. At 84, his social media presence is strong: watch his latest campaign advertisement on facebook (“Sheriff Joe Arpaio. 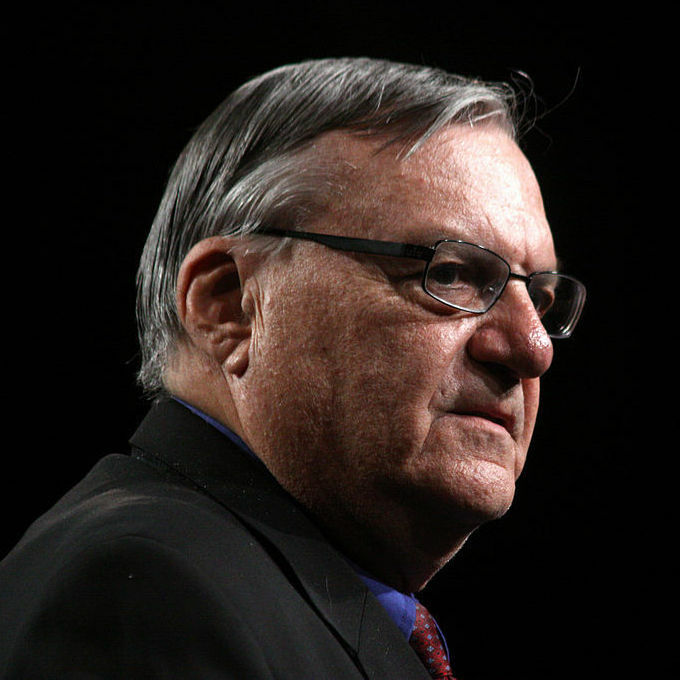 Tough on Crime”), or read his tweets about appearing on the O’Reilly Factor via his twitter handle @RealSheriffJoe. Visit pinkunderwear.com and buy authentic Sheriff Joe swag (the website boasts that “Sheriff Joe's pink underwear, pink handcuffs, and his innovative law enforcement programs have been featured in more than 2,000 U.S. and foreign newspapers, magazines, and TV”). Fans can read about his exploits in biographer Len Sherman’s 2008 Joe’s Law: America’s Toughest Sheriff Takes on Illegal Immigration, Drugs, and Everything Else That Threatens America. This image of Arpaio as a pragmatic “average Joe” who gets things done belies his deep involvement in politics. The sheriff was an early supporter of Trump, endorsing him in January as a "great patriot." The two have a much longer history, though: Arpaio was one of the first public figures to align himself with Trump’s obstinate mission to “seek the truth” about Obama’s birth certificate. 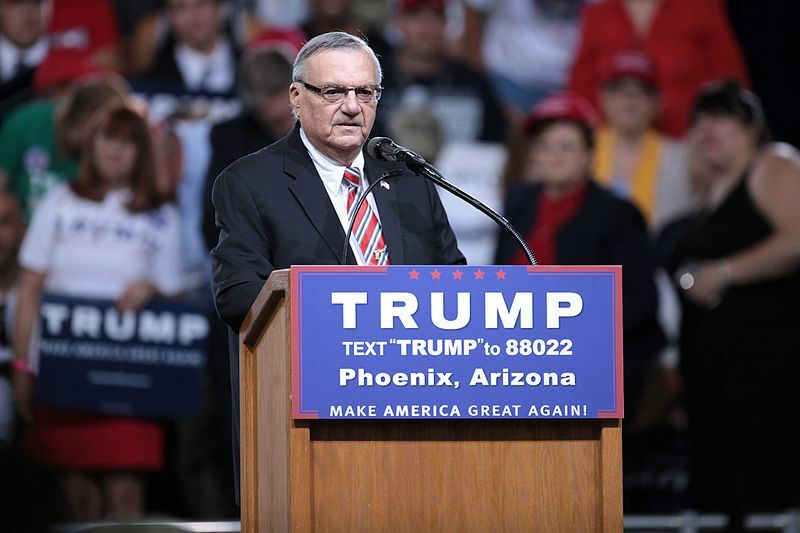 Trump is just one of the many politicians Arpaio has endorsed; Republican candidates often seek his endorsement because of his strong anti-immigration stance. Arpaio’s enthusiasm for the birther myth is a good example of what happens when his dogged, “I do what I want” attitude collides with the world of politics. The East Valley Tribune’s five part investigation into Arpaio’s illegal immigration enforcement effort won the 2009 Pulitzer Prize for local reporting. But politics are clearly the main reason very few will get into a public fight with the popular sheriff, who responds to his critics through news release blasts. His political ties run deep; he’s often allied with state lawmakers and city officials. Earlier this year, he campaigned for Republican presidential candidate Mitt Romney. County and federal agencies that have oversight over — and some ability to restrict — his operations have done little to interfere with Arpaio’s broad enforcement effort. Agency officials, many of whom are elected themselves, cite his widespread popularity with voters. They are reluctant to even talk about him. In March, Phoenix Mayor Phil Gordon was the first high-level elected official to publicly go against Arpaio’s immigration sweeps. In a speech to the annual Cesar Chavez Day luncheon, Gordon — fed up with crime suppression operations in northeast Phoenix that drew hundreds of protesters and fears of violence — accused Arpaio of going after “brown people with broken taillights.” He urged other political and civic leaders to speak out against what he saw as clearly racist roundups. But his call to action went largely unanswered. Some church organizations and Hispanic activists wrote letters and organized protests at meetings of the Maricopa County Board of Supervisors and elsewhere, but broad support for Gordon never materialized. Midway through Richard Montoya’s NOGALES, the character Kat Rodriguez reminds us: “somehow we’re all complicit.” Arpaio is a man in the spotlight, with a varied history of public legal battles, political entanglements, and controversial acts. But the Arpaio brand is only possible because of a long legacy of many people looking away. Come see Sheriff Arpaio and the other characters of Nogales this weekend at Magic. Tickets available here.